Is there a connection between miracles and the Messiah’s coming? 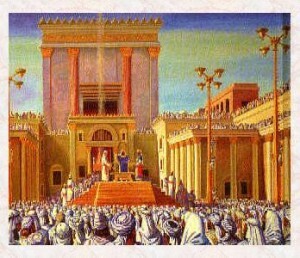 If a king will arise from the House of David who diligently contemplates the Torah and observes its mitzvot [commandments] as prescribed by the Written Law and the Oral Law as David, his ancestor, will compel all of Israel to walk in (the way of the Torah) and rectify the breaches in its observance, and fight the wars of G-d, we may, with assurance, consider him Mashiach [the “anointed one,” which is the word in Hebrew word for “Messiah”]. If he succeeds in the above, builds the Temple in its place, and gathers the dispersed of Israel, he is definitely the Mashiach. This is a question concerning which there is a difference of opinion among our Sages. Our prophets say (Michah 7:15), “As in the days of your exodus from Egypt, I will show you wonders,” implying that the exodus from Egypt serves as the archetype for redemption, and that the future Redemption will also be characterized by great miracles. Similarly, we find many prophecies of Mashiach’s coming, e.g., “a wolf will dwell with the lamb,” (Isaiah 11:6) which clearly point to a fundamental change in the natural order. According to this view, as explained by Maimonides (Laws of Kings 12:1) the prophets’ statements are merely allegories used to describe the changes that will occur at that time. For example, in the prophecy cited above, the “wolf” represents the gentile nations, and the “lamb” the Jewish people; in the Era of the Redemption, the Jews will live at peace with the gentiles. Similarly, in regard to the Era of Redemption as a whole: its advent will bring about a transition in every phase of our lives. Nevertheless, the natural order will not be upset. One should not entertain the notion that the King Mashiach must work miracles and wonders, bring about new phenomena within the world, resurrect the dead, or perform other similar deeds. This is [definitely] not true. A proof can be brought from the fact that Rabbi Akiva, one of the greatest Sages of the Mishnah, supported King Ben Koziva , and would describe him as the King Mashiach…. The Sages did not ask him for any signs or wonders. Maimonides continues (loc. cit.) focusing on “the main thrust of the matter: This Torah, with its statutes and laws, is everlasting”; i.e., his conception of Mashiach is that of a Torah leader, not a miracle worker. There are other great Rabbis who advanced the opinion that the Era of the Redemption will be characterized by miracles. Similarly, in regard to Mashiach, they posit that he will prove his identity by performing wonders. Significantly, in another text (Iggeres Taiman), Maimonides himself mentions the possibility of Mashiach coming in a miraculous manner. In subsequent generations, the Rabbis have tried to resolve these two views, explaining that Maimonides also believes there will come a time when the natural order will give way to a miraculous frame of reference. For Maimonides lists as the last of his Thirteen Principles of Faith, belief in the Resurrection of the Dead; this surely represents a drastic deviation from the natural order. Thus these authorities explain that, according to Maimonides, there will be two periods in the Era of the Redemption: one directly following the coming of Mashiach in which the current natural order will continue to prevail, and a subsequent period of miraculous occurrences, including the Resurrection of the Dead. In this framework, Mashiach’s goal will be to initiate a new age of understanding and knowledge. To do this, he will be a teacher and leader. The wonders he works must be within people’s minds, not necessarily within the world at large. The concept of the world as G-d’s dwelling, however, leads to a further concept. Just as a person expresses himself freely in his own home, G-d’s essence will be revealed within our material world. This implies the revelation, not only of the limited dimensions of G-dliness that can be enclothed within the confines of the natural order, but also the expression of transcendent aspects of G-dliness whose manifestation will nullify that natural order. These transcendent qualities will be revealed in the second period of the Era of the Redemption. We see this plainly in our time (July, 20’14) in the Land of Israel, when the miraculous Divine protection of the Land of Israel under fire resembles the protection G-d gave the Israelite nation when they were trapped between the sea and Pharoah’s army (Exodus 14:19): “The angel of G-d who had been going in front of the camp of Israel moved and went behind them; and the pillar of cloud traveled from in front of them and went behind them.” Rashi explains: “and went behind them” – to separate between the camp of [the Pharoah from] Egypt and the camp of Israel, and to intercept the arrows and catapult stones [fired by Pharaoh’s army] of Egypt. Thus man’s virtue, or lack of it, will determine whether Mashiach will come in a transcendent, miraculous manner or will follow the slow, but steady path of a donkey’s progress.